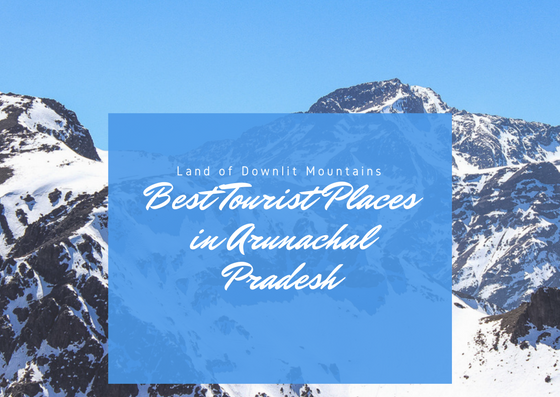 BEST PLACES TO VISIT IN ARUNACHAL PRADESH. 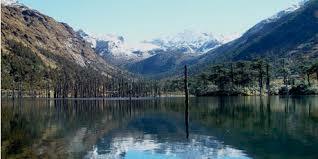 Arunachal Pradesh is known as land of rising sun and Land of Downlit Mountain. 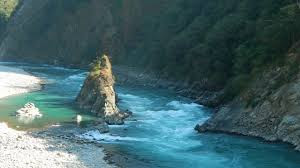 It is one of most beautiful state of Northeast states of India. This beautiful state has is rich in beautiful natural scene, History and ruined Archeological sites and many mores. State has vast potential in Tourism Sector to boost State economic. 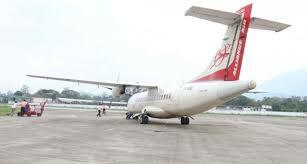 Arunachal Pradesh also organized Tourism Festivals every year to motivate the tourists to visit Arunachal Pradesh. Let’s have a look into the some of most important Tourist places of State. Malinithan is situated in the foothills of West Siang District. 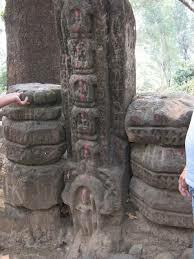 The architecture of temple is Orissan style, famous sculpture of temple are Indra on Airavata, Kartikeya on Peacock, Surya on Chariot, Nandi Bull and Bramitical images etc. most of these sculpture are made of granite and sand stone. It is dated back to 10-12 A.D. Malinithan mela is organized in April of every year. 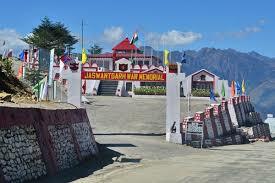 Tawang is one of the most beautiful Disrtict of Arunachal Pradesh. It is famous its Monastries and beautiful natural like hills covered with snow, Lakes, Snowfall etc. 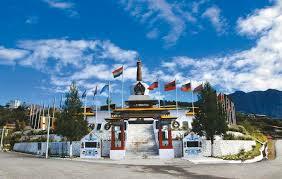 Tawang monastery is one of the biggest monastery Mahayana sect in Asia founded by Meera Lama Loder Gyatso in 1681 A.D. It covered an area of 135 sq.mtrs enclosed by compound wall of 610 mtrs long. Within the complex there are 450 residential building for Monks and other structure. The golden statue of Lord Budhha is 28 ft. high. The Library has around 850 bundles of valuable old scriptures mainly Kanjur and Tanjur it is dated back to 17th Century A.D. 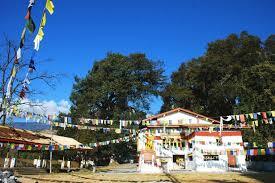 The local name of monastery is Tawang Golden Namgya Lhatse. Itafort is situated in Papumpare District. 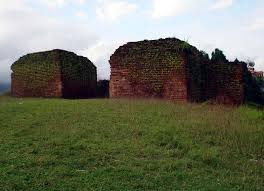 It is historical fort of an irregular shape built mainly with bricks of various sizes. It is of 16200 cubic metres length. There are three gates on three sides Eastern, Western and Southern. It dated back to 1350 to 1550 century A.D. it is estimated that more than 80 lakhs of bricks, 45 centimeters of stones and 46300 man days were required to building up of the Fort. The local name of fort is Hita-Rokpo. 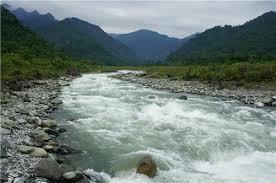 Parasuram Khund is situated in Lohit district of Arunachal Preadesh. It is one of the most important Pilgrm place of Hindu religion in Notrheast State. On every Makar Sakranti Day of 14th January the Pilgrims came from different parts of Country and take holy dip in Khunda. The legend of Khnda is associated with Parasuram’s matricide. A grand mela is organized on this occasion every year. Bhishmak Nagar is located near Roing of Lower Dibang Valley district. The fortress has elongated semi-circular shape existing over an area of about 10sq.km. The complex has brick built of 1860.52 m.plinth area. The name was given after king Bhishmaka. It is believed to be from 12th to 16th century A.D.
Megalith is located in jimiri in West Kameng district. 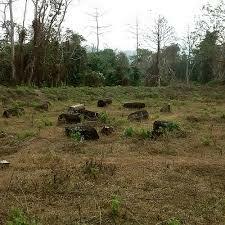 In March 2010 a few Megalith were found at Rupa, Segaon in West Kameng district of arunachal Pradesh. Megalith also found at Borduri village of Tirap district. 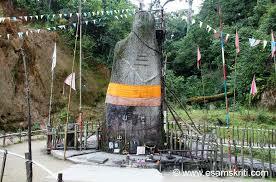 The Tamreswari Temple is situated near Sadiya in Lohit District of Arunachal Pradesh. This Temple is believed to be built in 1441 century A.D. 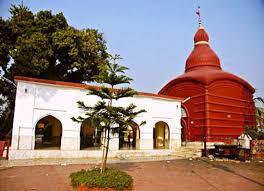 The roof of Temple is originally sheeted with copper, from which temple got its name Tamreswari. The compound wall of the temple is 4 feet wide and 8 feet in height. It situated on the hillock in the foothills of West kameng district. 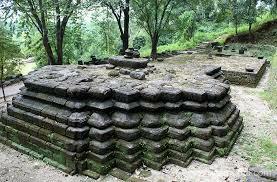 It is believed to be a capital city of King Bhaluk, the grandson of Bana. Numbers of the historical fort are now existed. It is dated back to 10th 12th Century A.D. It is a centrally protected Monument. Parsiparlo is situated in the Kamla valley of Kurung Kumey district. It is Neolithic site, the tools and other valuable findings indicate that people of Neolithic era were living here before. 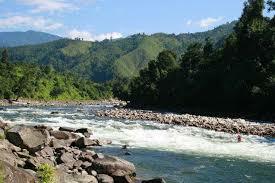 NashaParbat is situated in District of Arunachal Pradesh. Many significant archeological has been found here some of significant findings are stone built plinth of houses, a ring well, few sculpture pieces, potteries etc. which is believed to be from 14th to 16th Century A.D.
An Archoelogical site of medieval period situated at Gomsi near Pasighat in East Siang district. 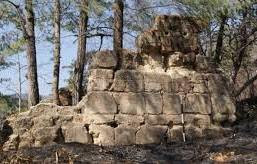 The trace of old habitation over an area of eleven acres or so is found.A portion of ruins surrounded by earthen ramparts and nallahs. Two big earthen mounds,a ponds, plinth of few delipated houses are also located in the site. There is two huge Mud fort namely Hatiduba and Tindalong has been found near Tezu in Lohit district. The Hantiduba covers an area of 43.68 acres of land and comprises of earthen enclose and high eathen mound. The rampant is 2.80 mtr high and broad at the top. It is believed to be from 14th 15th century A.D.
An oldest fort and Gompa belong to 16th century A.D of Mahayana sect of Buddhism is situated in Sanglam village under Kalaktang cirlcle in West Kameng district covering area of 1179 sq.mtr. It situated at Zemithang 92 kms away from away from Tawang, it is one of the largest Buddhist Stupa in Asia with plinth area of 18 feet and height of 100 feet. The massive religious structure exhibits a unique monastic architecture with stone and mud having Tri-Ratha base constructed by Lama Prathar during 17th century A.D which took 12 years to complete. 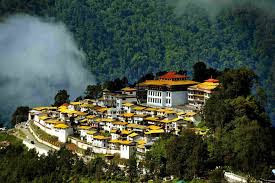 It is considered as one of the oldest monasteries located 5 km away from Tawang. His Holiness Dalai Lama Tsangyang Gyatso was born here in 1683 at Urgyeling village. 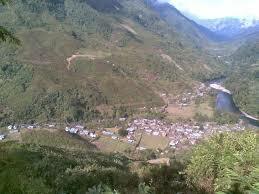 Is located in Shergaon village of village of West Kameng district. It is one of oldest Gompa among all other Buddhist temples os the district, which existed before 17th centuryA.D. It is built by Monk Lama Jangseey Pejang. 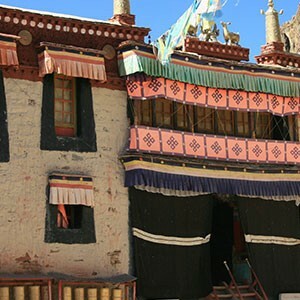 The specialty of the Gompa is that whole structure is made up of mud. Therefore know as Kamchoo Yam-literally meaning mud house in sherdukpen dialect. Keker Monying which meaning Black Rock in local language is located in the East Siang district. It is one of the important memorial of the State. The Adi’s people fiercely fought with Britishers on 14th December where a good numbers of died. It is a great stone cliff standing 50 mtr above the Siang reiver belt and about 500 metre in length. Achnimuri is located at Upper Siang district. On 22nd October 1953 Tagin people massacred a Govt. officer and few officers of Assam rifles and around 50 porters. 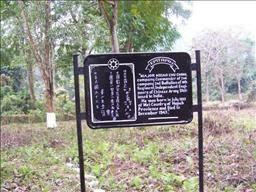 This war cementry is located at Jairampur of Changlang district. It is a second world war cementry (1939-45) which comprised of one thousand graves made of brick with cement mortar is came into light in middle of 1998 near Jairampur. Steps are taken to preservation to make it tourist place. A memorial in memory of the martyrs of the 1962 Sino India war is built up and dedicated to nation on 2nd November 1999 by Lt. General H.R.S Kalkat. The architecture of memorial is in harmony with local traditions of Buddhist community. It is 40 ft. high Stupa from Namgyal Chorten. Name of 2376 dead soldiers of 1962 war are inscribed with black granite plaques. This is also famous tourist place. The Jaswant Garh was built in memory of Jaswant Garh. A brave soldier who very bravely fought with Chinese soldier and sacrifice his life for nation. It is situated in Bomdila-Tawang road before Sela pass. The personal belonging of the soldier is on display. A war monuments built with stone by Adis to fight against the Britishers in 1894. 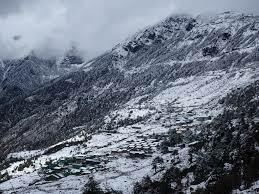 It is situated in the Dambuk area of Lower Dibang valley district. 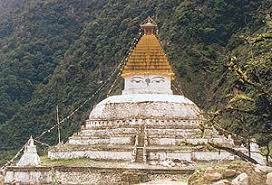 It is situated in Ziro (Hapoli) deep under the jungle in Lower Subansiri district. Many tourist and devotee of Lord Shiva visit this place to worship here. This Linga is very huge in shape and size, it is holy place for Lord Shiva devotee. Arunachal Pradesh is bordered with Myanmar about 144 km in the eastern sector. 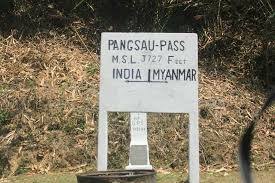 The patkai range with Pangsau pass lay between the border of India and Myanmar connected by Stillwell road. The Pang means field and Sau means stay in Thai Ahom, Singphos and khamtis pass through this route on the mountain where they rested on it and name the resting place as Pangsau pass. 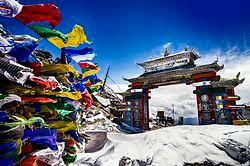 The Sela Pass is high altitude mountain pass located at Tawang in Arunachal Pradesh. The height of this Pass is about 4170 m (13,700 ft), the pass is always covered with snow throughout the year. It is believed that around Sela Pass there are about 101 Lakes exists in this Pass. The temperature can go down upto -10 degrees during winter season. An interesting story is related with this pass, that during 1962 India-China war a soldier of Indian Army named Jaswant Singh bravely fought with Chinese armies and one local lady named Sela always brought food and water for Jaswant Singh. But one day she killed herself on seeing the dead body of soldier. Later Jaswat awarded with ParamVir Chakra by Indian Govt. It is a place of pilgrimage and secret hunting place and a secret hunting ground of rare one horned called Takin of the Mahayana uddhist community viz. Memba at khamba situated at distance of 10 to 12 days foot road from Tuting in Upper Siang district. 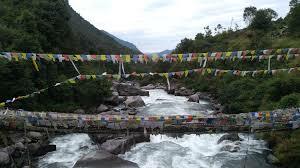 The Bridge was built by architect popularly known as Lama Chag-Zam Wangpo. It is built around more than 100 meters over river Tawang Chu during 15th century (1420-1430A.D) situated at Mukto in Tawang district. It is one the oldest Bridge in India. 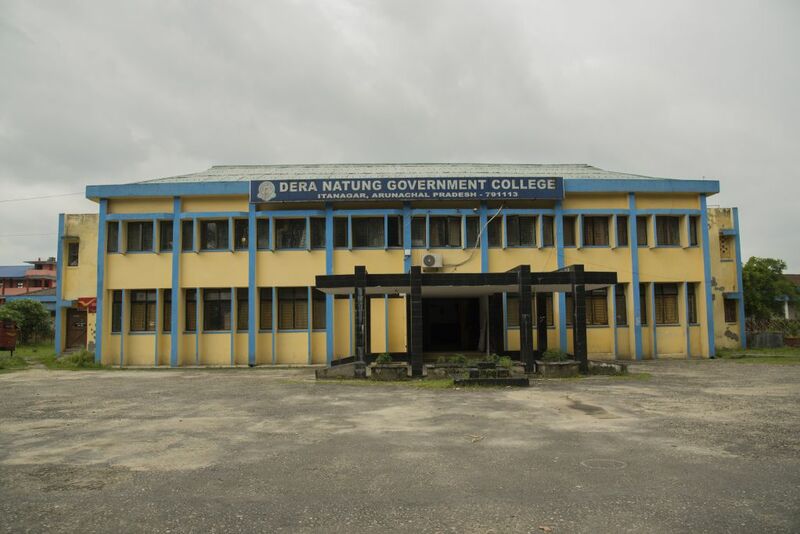 It is situated at Dorjeeling village under Mechuka circle in West Siang district. It is a Buddhist shrine underground cave with image of Lord Buddha and other deities imprinted on the work of cave. It is believed that once a great Lama mediated inside the cave three years without food and water. 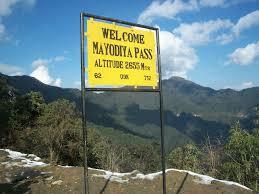 Mayodia is situated at Dibang valley district at altitude of 2655 meters above sea level. It is popular tourist spot place for adventurous tourists. Mayodia got its name from Nepali girl, Maya who vanished untraceable in snow. It is about 100 kms away from Dibrugarh Assam. It is a holy site situated on a hill near the confluence of Sessa and Siyik River at a place called Sayi located at a distance from 45 kms away from Aalo. Benji siginified supernatural power and Liine denotes the motherstone bearing all the seven hotsprings namely Jibi, Jizab, Jipu, Jiji, Jipo Jinya and Jiyi. The motherstoner is 1.5 fit high and about 2 fit wide and bears the white colors on the top. Ganga Lake is located in Itanagar of Papumpare district. The local name of the lake is Gyekar Sinying. This lake is surrounded by beautiful greeny forest.People from all over state visit this Lake. This place is famous for boating, picnic and other recreation facilities. 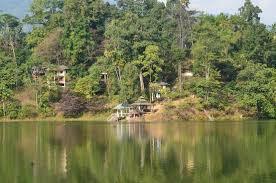 The Lake of No Return is located at border of Indo-Myanmar near Panchu pass in Changlang district. 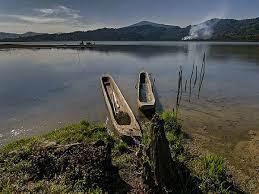 In Tangsa language the lake is called as Yung-Yeng or Yong-Jing, it is a natural lake which had earned the obnoxious distinction as people venturing into it for fishing and swimming never returns. The people narrated that many fighter plane had reportedly crossed the lake and disappeared into the swampy lake and this in became horror. It is natural lake located at 14 km away from Roing in the heart of Mehao Wildife sanctuary in Lower Dibang Valley. The water suface area is 100 hectors with periphery of 4800 mtrs at an altitude 1840 meters. The Lake is very rich in Flora and Founa. The real name of this lake is the Sangester Tso Lake which is located on the way from Tawang to Bum La Pass in Tawang. Later this beautiful lake is rename or known by Madhuri Dixit due to film shooting on this site, Madhuri as heroin and Shahrukh Khan as hero movie was Koyla. Some Monk oppose for renaming this Lake. Anyway this is beautiful Lake surrounded by beautiful snow caped mountains and valleys. According to Locals this Lake was formed due to flash flood of 1950s earthquake. Located at Itanagar, it is only 6 km away from Itanagar town. It is a miniature zoo which is kept very clean and surrounded by greeny forest. This Zoo is famous for Bengal Tiger, Leopard, Clouded Leopard and other animals like Monkeys, Birds, and Deer etc. 1. 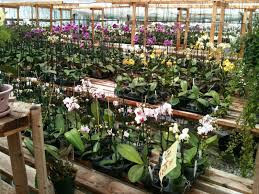 Asia’s third largest Orchidarium is located at Tipi in Arunachal Pradesh. 2. The Tawang Monastry of Arunachal Pradesh is one of the Oldest Monastery in Asia. 3. 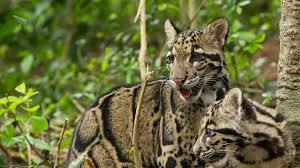 Arunachal Pradesh is the only State in India where species of four cats are found i.e Tiger, Clouded Leopard, Leopard and Snow Leopard are found. 4. 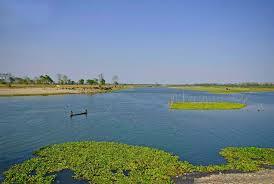 The world’s biggest river island Majuli and smallest inhabited river island Umananda are both located at Assam. 5. 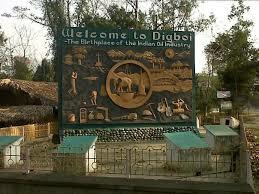 In India oil was first struck in Assam at place called as Digboi in the year 1889. 6. 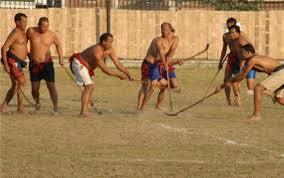 Khong Kangei, a Manipur version is played With 7 player on each side. The game is a mixture of hockey, football, rugby and wrestling. 7. 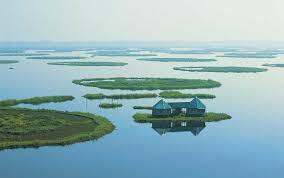 Loktak lake is the largest natural Wetland In the Northeast India. 8. Cherrapunji in Meghalaya of Northeast India receives the highest rainfall in the world. 9. 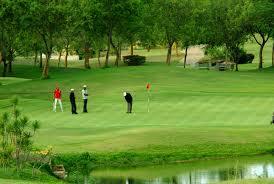 The Shillong golf course is one of the oldest and best natural golf course in the world. 10. 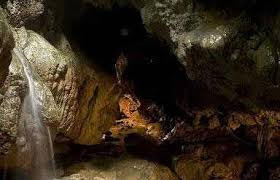 Out of the top 15 longest caves in Indian sub-continent, 14 are found in Meghalaya and again out of top 15 deepest caves in Indian Sub-continent 14 are found in Meghalaya alone. 11. 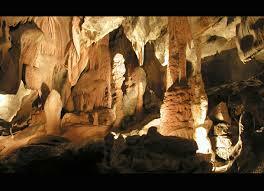 Punking caves situated at Pukzing village, near Marpara in the Mamit of Aizwal is the Largest caves in Mizoram. There is legend hanging with this cave, which says that cave was carved by the piercing the heart of hills with the aid of single hair pin strong man named Mualzavata. 12. 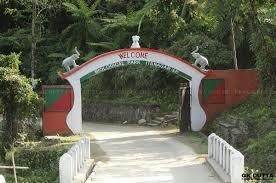 Bara Basti in Kohima in Nagaland is on of the biggest and most populous village in Asia. 13. 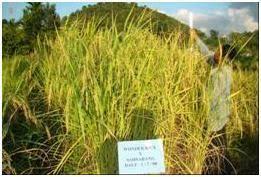 79 year old Mr. Pastor Melgite Kenye of Chumukedima village in Nagaland got Guinness book of world record for breeding the tallest paddy plant in the world of 8 and half feet long, which he named Melhite Kenye Lha. 14. 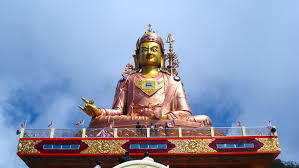 The statue of guru Padmasambhava near Namchi in South Sikkim is the tallest statue of guru Rinpoche in the world. 15. Tripura Sundari temple situated at ancient Udaipur is believed to be the holiest Hindu shrines in India. There are two identical images of the same deity in the temple named Chotima, one is around 2 feet in height and other is about 5 feet in height. 16. 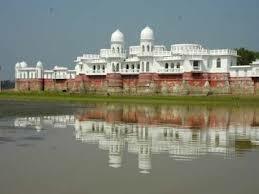 Neermahal is the only Lake Palace in the Northeast State of India. Play Games Online & Earn Money. Yes you can earn some cash by only playing games on your computer, laptop, tablet, cell phone from your home. If you are thinking to earn money by playing games online here are some list from internet choose anyone from below or you can try all games mentioned below. Everyone loves playing games why not play for some cash prize. 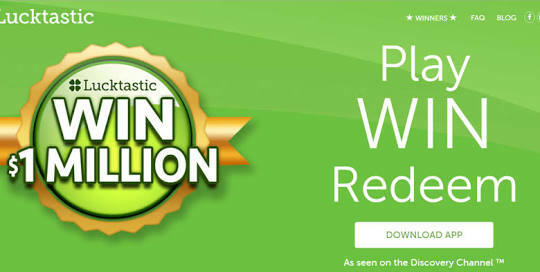 Lucktastic is free you can earn by playing scratch cards.Lucktastic is a free app where players can win real cash and prizes and earn rewards. This app is available for both ios and android phone. You can early daily rewards, play scratch cards, refer friends, and enter contests to earn money tokens. There are also additional ads you can watch and surveys you can enter. Each time you play a scratch ticket you can win either cash or more tokens. Tokens can be used to enter sweepstakes for prizes or can be redeemed directly for gift cards. However, you need a lot of tokens if you want to claim a prize directly. Cash winnings can be withdrawn via PayPal or check. There have been complaints that payments to take a while to process, but they eventually do come. If you’re lucky enough, there are scratch tickets that reward incredible cash amounts of up to $5,000 dollars. 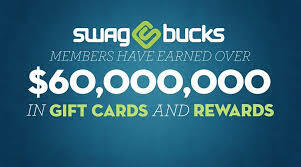 Swagbucks is one of the most popular site for earning online. 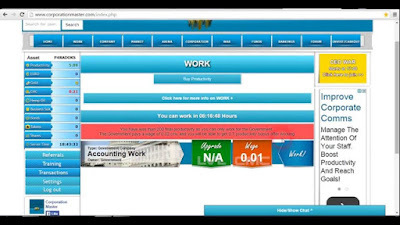 There are many ways to earn money like taking survey, watching videos, playing games, shopping online, searching on swagbucks search engine. Swagbucks gives SB instead of point to its user. Once you have got some SB in the bank, just trade them in for gift cards from Swagbucks’ many partners that include eBay, Walmart, Starbucks and Subway. There is a Paypal gift card too, and if you trade that in, you are basically getting cash. On the platform, 1 SB = 1 cent. Minimum payout in Swagbuck is $25 via paypal account other rewards are amazon gift cards.Payments take approximately 10-14 days to process and will be issued in US dollars.You can also request for e-gift card to major retailers such as Amazon, Home Depot, Starbucks, and more. Other options include Facebook credits, iTunes cards, restaurant gift cards, Cineplex credits, and hotel credits. E-cards are awarded within 10 days of request and denominations of anywhere from $1 - $100 are available. LaLaLoot is one of the world's leading casual gaming communities with free cash reels game. Free online games with real cash prizes.LaLaLoot: one of the world's leading casual gaming communities with free cash reels game. The way to earn money on LaLaLoot is to win games using tokens that are earned by completing offers. During the first 5 days of your membership you are able to earn tokens by simply viewing advertisers’ offers. After the initial 5 days tokens are earned by completing offers provided by advertisers and sponsors. For each offer completed in its entirety, fulfilling the unique requirements of that specific offer, you will earn the number of tokens displayed on the offer. As you continue to earn more tokens, you can play more games and increase your chances of winning. To request a cash-out, you must have at least $20.00 in winnings; it takes approximately 4-6 weeks to receive payment. Inbox dollars is a website that you can join to earn some extra money in a variety of ways, like playing games, trial offers, taking surveys, referring others and a bunch more.There are free games and paid games offered through GSN where you earn extra reward dollars when you play through Inbox Dollars. 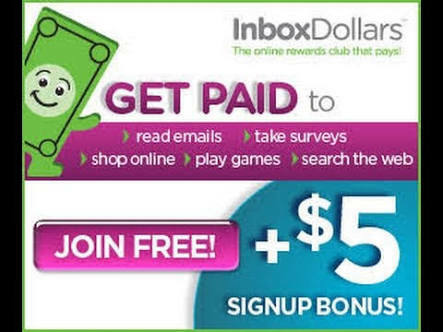 Inboxdollars will instantly credited $5 in your account as signup bonus, but minimum payout is pretty high compared to most sites at $30, but you get $5 just for signing up, so it is more like $25. For the high payout minimum, I was still able to cash out pretty quickly with InboxDollars. Paid Game Player is a website that pays you to; play games online, perform tasks, and complete trial offers. The site offers puzzle games, action games, word games, and different products to test. Furthermore, there is a section on the site that pays you to view ads.There are over 600 games to play, and you compete for cash against other players. They pay $250,000 in daily cash and prizes for game tournaments and other activities. You can also earn money by completing surveys, reviewing games and products, and referring your friends to play as well. This site has been online since 2006 and is a legitimate site to work on. However, you can’t make a lot of money on this site unless you upgrade your account. With an upgraded account you can play games for money. Otherwise, you can make money taking surveys, completing offers, or clicking on ads. PaidGamePlayer.com is a free gaming site. You never have to pay a cent to enjoy 1 hour of access to over 500 different games. You earn points by playing games, then use those points to enter into weekly, monthly, and daily cash prize draws. 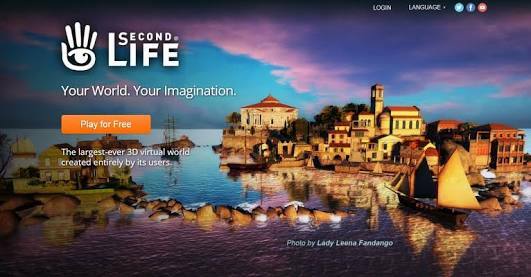 Whether you’re paying $4 per month for a premium account or just looking for a free and fun way to make money online, Paid Game Player could be worth a try. GSN WorldWinner is a skill-based gaming website that allows you to compete against other people for real money. ... You can play in heads-up matches against other people or participate in large tournaments for cash prizes.You can win cash by playing in tournaments at World Winner. Tournaments are available for casino games, arcade games, game show games, strategy games, and word games. Whether you are a crack at Scrabble, Bejeweled, Wheel of Fortune, or Solitaire, there’s a tournament for you. 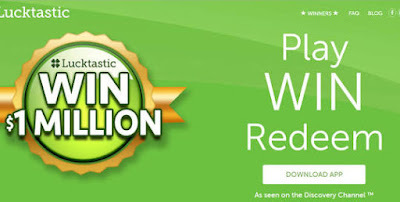 You can play both real and play-money games on WorldWinner by visiting the website and signing up for an account. Once you have an account, you can try the play-money games first to acquaint yourself with the rules and get comfortable with playing against other people. If you want to play for real money, you can visit the account area to make a deposit and fund your account. WorldWinner.com accepts VISA, MasterCard and PayPal. They only allow deposits of $10, $20 or $30 at a time. After you deposit, you can test your skills in the games area. Each game can be played against a single person or in a tournament-format with multiple people. The rules of each game vary, but the goal is always the same: to get a better score than your opponents. If you win a game, World Winner will credit your account with the winnings. Most games are only played for a few dollars, but they do occasionally host larger games with higher payouts. If you win money, you can withdraw your winnings and go have fun with the extra cash. With Cash Crate, you can earn money by playing games, taking surveys, shopping online, testing new products and websites, and interacting with other users. 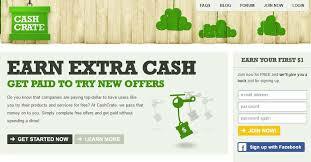 Cash Crate has been around since 2006 and has more than 2 million users. You can earn extra points by entering tournaments. If you win or meet specific objectives, you earn bonus points. There are 12 different game tournaments to choose from ranging from Solitaire, TriPeaks, and Blocks. Using Solitaire as an example, you can earn points when moving a card from the deal pile to row pile, 25 points for turning a card over, and 100 points for moving a card to the suit piles. You will need to act fast as you lose two points every two seconds on the timer and 100 points when you refresh the deck. Tournaments cost one or two points to enter. You can earn points by first completing surveys and additional product offers. Completing an activity can earn anywhere from $0.25 to $50! Once you earn $20 in rewards, you can receive a cash payment and earn an additional cash reward for taking a picture of your check. And, you get a $1 bonus when you sign up. Exodus 300 is a popular RPG (role-playing game) that has paid out over $65,000 since 2006. The setting of Exodus 3000 takes place 1,000 years in the future when the Earth is uninhabitable, and you now live on Mars. In the game, you explore the Martian surface, form alliances, and also combat with enemies. You earn money and prizes in Exodus 3000 with a digital currency called Mars Dollars. These dollars can be earned by mining volcanoes, searching ruins, and attacking other players. You make your first 5,000 Mars Dollars when you join the network. With the current exchange rate, 300,000 Mars Dollars equals $20 in cash rewards. 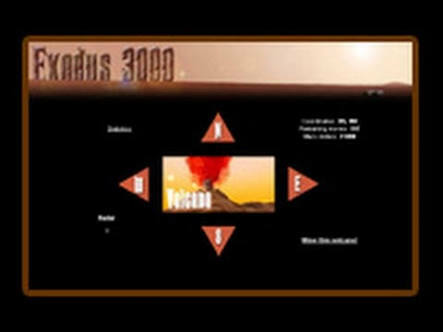 For gamers that don’t want to install yet another program onto their computer, Exodus 3000 doesn’t require any additional software. You can start playing as soon as you complete the sign-up process which only takes a minute.Once you sign up as a member, you get 5000 free Mars Dollars as a welcome bonus. Gamesville is a leader in the online game arena and has been around for a long time. In fact, it was created by Lycos if your memory goes back that far in Internet history. 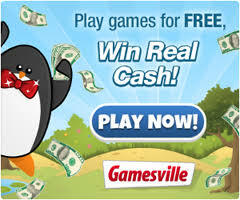 With Gamesville, you can get paid in two different ways. The first way is through free tournaments for just about any game, including bingo. A second way to earn money is to play individually in games where you race against the clock. Some games even have progressive jackpots. When you win a game, you are awarded GV Rewards. The rewards can be entered for prize drawings. They also have a cash tournament section where you do not receive GV Rewards. 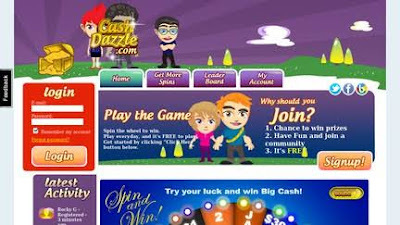 Cash Dazzle offers a wide variety of games. You can play free games to earn tokens, which you can then cash in to play games that will earn you cash prizes. On the main page is also a “Spin the Wheel” game that gives you a chance to win the current jackpot! The cash prize will keep rising until someone wins, so it’s a good chance to earn some serious cash. You can also earn 10 points by referring friends. You can create an avatar, save high scores, and meet new friends too. Now you no longer have to go to the Bingo Hall each night to play. 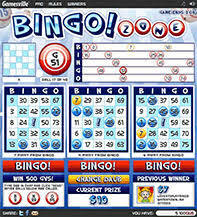 Bingo Zone is completely free to play. There is continually a bingo round in play, so you never have to wait long to join in. The minimum payout is $1, and the prize continues to increase until somebody wins. Other gaming sites offer bingo, but very few allow you to play and win for free.Once you register, you can play a variety of daily Bingo games for free. Corporation Master is a game in which players can simulate a real economy. It’s all web-based and there’s nothing to download. You can do things like invest in companies, sell and buy stocks, work, and even enter a war. It’s a pretty strategic game, so it’s not the kind you can just sit back and watch for casual gaming. You might find that you need to invest some money to make money, but several online guides show that, much like real life, investing in your corporations and other things can have significant benefits to your cash flow. Still, it’s not necessary to spend anything, and you can register and start playing for free. You can also purchase referrals, which gives you extra money whenever your referrals do certain things within the game, like withdraw money from a corporation. Pgo has free games and paid games for every platform (PC, mobile phone, Wii, Xbox, PS3, etc.). Game categories range from your traditional games like Backgammon and Poker to the latest arcade games. There are two different prize payouts with Pogo. You can enter to win a $50 daily drawing or a jackpot of up to $500. For the second option, you participate in games that dangle a Jackpot with them. So if you win, you straight away walk off with prizes that can go up to $4,999 instantly.